So it has happened. South Africa showed the world that they can actually pull it off in nice style next year. Only one week before the start of the short tournament, highly regarded by Fifa, Brazil and South Africa but pretty much ignored by the rest of the world, champions included (more of this later, I’ve realized that, for me, regardless of the results, it would have been a great experience. I’ve never watched Italy live. Or any world champion. Before 2006, Italy was ruling the world in 1982, and I was too damn small to convince my dad to take me the matches. Plus, pretty much like now, the team was ageing not very well and Italy kept touring around Italy but not very often they were playing around Milan. It doesn’t happen that often that your team is the current world champion, that they play a minimum of 3 matches within a radius of 50km from your house, and that you can afford the tickets. Yet, this was one of the secondary reasons why I moved down here in 2007. Lindsey knew I was very excited by finally seeing her husband breaking the usual work routine and for once forgets about real life and the pressure at work. 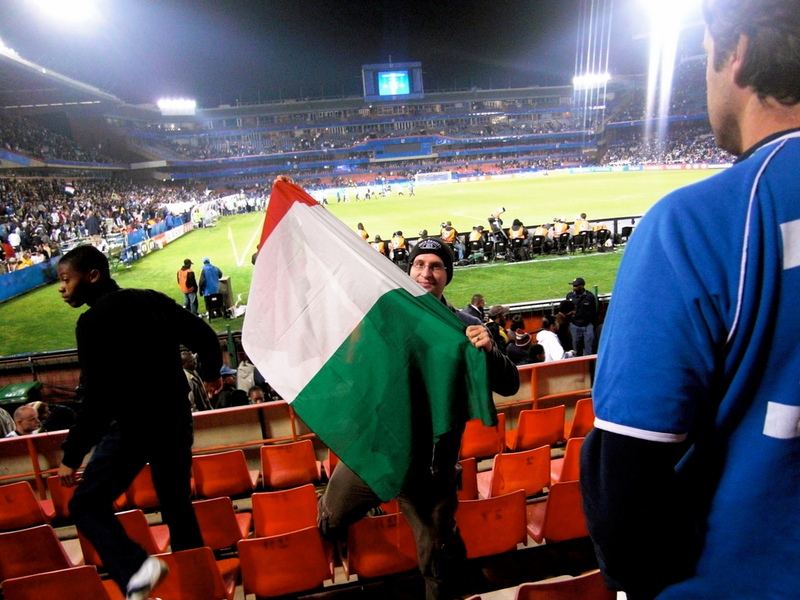 Just like a kid, I had my Italian shirt ready to me shown to the world, together with my flag and my lungs. 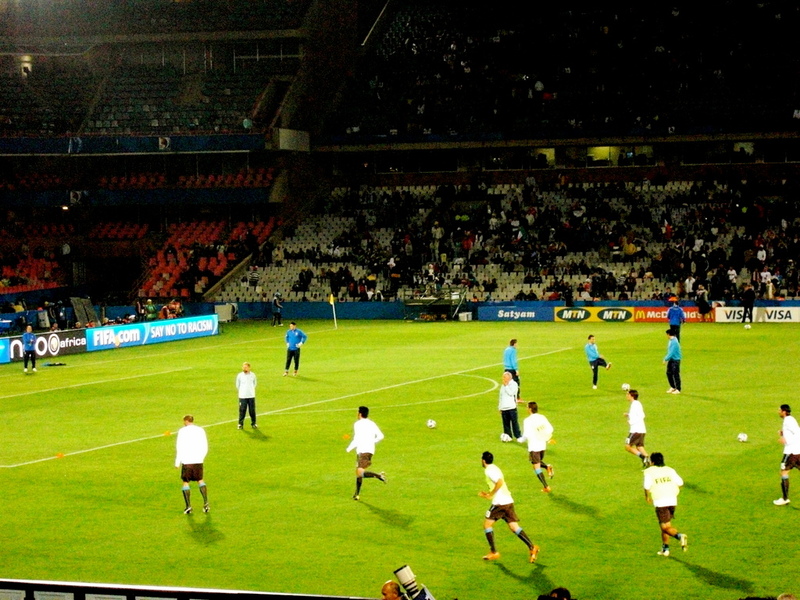 The first scheduled match was going to be Italy against USA, in Pretoria. Never been to the city or the stadium, so when David agreed to come with me (I had 2 tickets for each game) I was more than happy to go with someone with the knowledge of the area. Lindsey decided to stay home for this first game on a Monday night, knowing that the next day she would have found some problems waking up the next morning. Not a problem, I said. You can always enjoy watching the world champions destroying Egypt and then play in a classic match against Brazil. How wrong I was. Italy has never been famous for playing like Brazil or, recently Spain. They have always won the hard way, and only with the right motivation. Ask Italy to play Malta, and they would win 2-1 just playing decently enough to get the victory. Ask Germany to play them, and the score would have been 8-0. Then, in the tournaments, everything change. Somehow the Italians find motivations when they play as underdogs or against a team that is more supported, loved or just plays better. Think about the last European Cup won by Spain. Who was the only team that Spain failed to beat? Italy, who lost only at penalties. So I thought I knew what to expect. 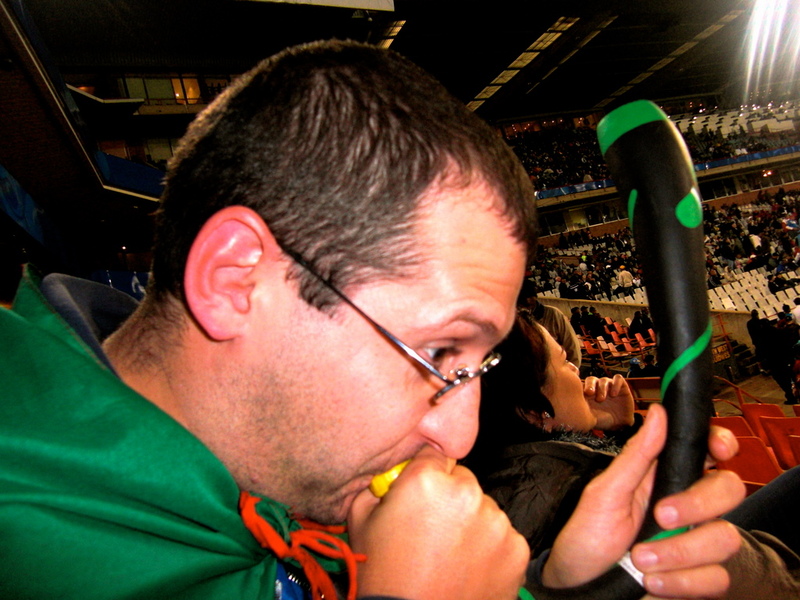 A lot of heart, runs and few goals, with the usual antics that make Italy so hated abroad, by male supporters. The girls couldn’t care less, as long as they are good looking they are ok. The first thing that I noticed by driving to Pretoria and parking in the designated area was the lack of congestion and the incredible organization provided by the local authorities. Everything just run smoothly, it felt like Switzerland, just with more blacks, less mountains and cuckoo clocks. The second thing was how damn cold the evening is in Pretoria (which is warmer than Johannesburg). 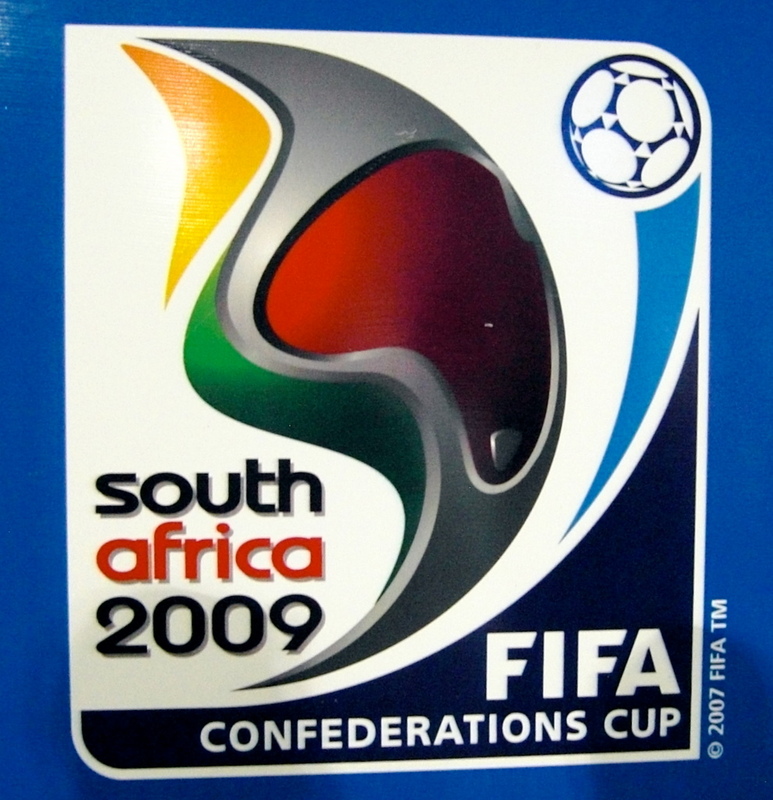 When they gave the world cup to South Africa I think no one really thought it thoroughly. It’s winter down here! Yes, it’s still nice and warm during the day but as soon as the sun sets down you are freezing! It will be the coldest world cup in history, and, in the area, the next one after Mexico 1986 where the lack of oxygen will test the players at this altitude. After approaching the parking area, we jumped on the buses for a short 10 minutes drive in the emptied area around the stadium. The Loftus Versfeld stadium is a structure commonly use for rugby and getting some revamp for next year. It’s just small, but, unlike most of the awful Italian stadiums, this is inspired by the English model: no athletic track, no barriers and very close to the action. My cheap tickets as South African residents (5 Euros each!) 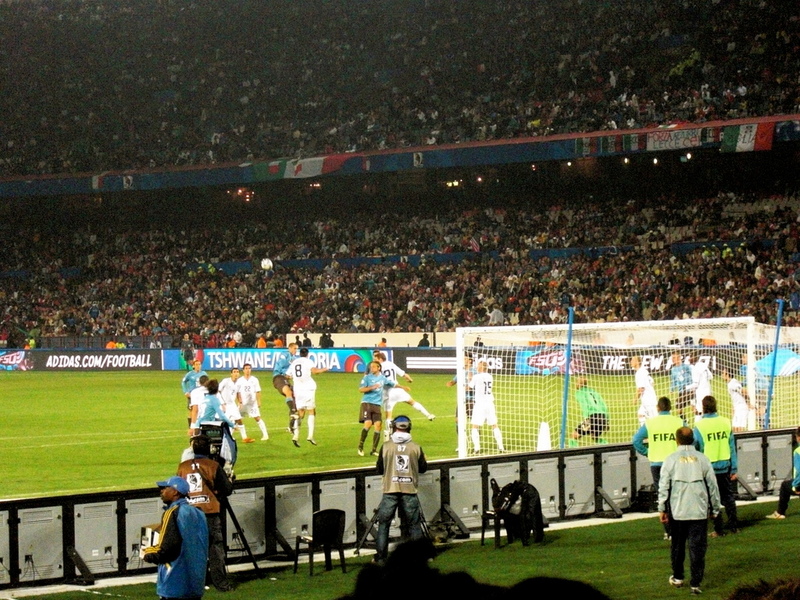 were located behind the goals, and I could see the action (as long as it was in the last 20 meters…). Luckily, all the goals happened where I was sitting. There isn’t much to say about the game. Italy won 3-1 after trailing 0-1 at the interval, thanks to a penalty given away by the idiot (Chiellini) in the centre of the defence. 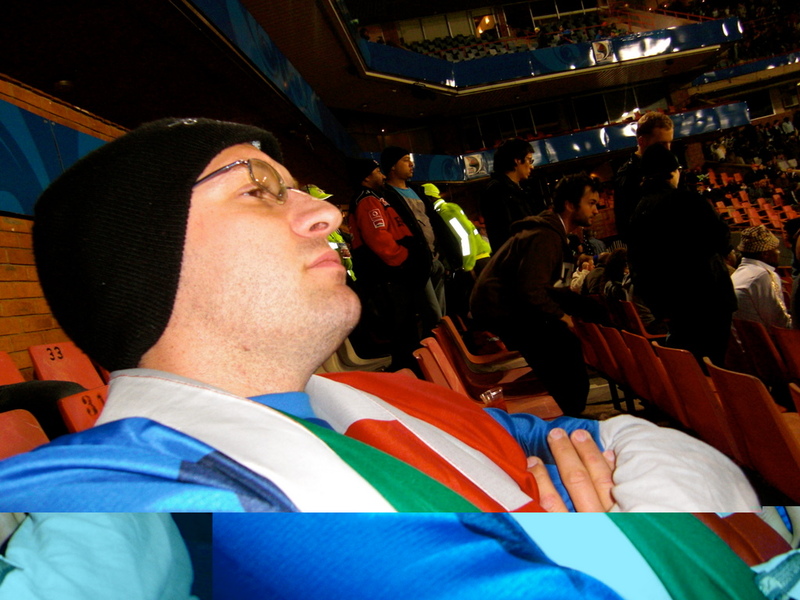 Only when the USA got a red card then Italy, 11 against 10, started playing decently and getting some confidence, but only when Rossi (a young player born in the USA from Italian parents) came in as substitute to score 2 great quick goals then I could relax. Nice way to start a tournament, but it’s hard to believe that Italy played so badly and uninspired in the first half… after all, as world champions, they should play much better!